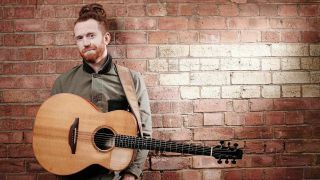 Newton Faulkner certainly keeps himself busy. When he hasn't been giving his acoustics a full-body workout with his incendiary percussive skills, he can be found playing the part of Johnny in Green Day musical American Idiot on the West End. Now he's back in guitar mode for the inaugural See Through Sound, held on 14 October in aid of the RNIB (Royal National Institute of Blind People), which also features the likes of Badly Drawn Boy, Doc Brown and Kevin Simm. "We always had guitars lying around the house, but I guess I got my first proper one when I was about 13. It was a Celebrity Deluxe Ovation, very pretty." "Ahh, that's like asking me which child to save! Old Benj, my first serious guitar." "I'm a bit of a hoarder when it comes to music stuff. I'm often writing songs and producing for other people, so you never know what you're going to need for that. It's rare I let things go. In fact, I've never let anything go." "Pedals! I'd like all of the effects pedals, please. I'm playing a bit more electric guitar and they are always useful studio toys for putting anything through." "There's not an aspect of guitar playing I don't want to be better at. There's always room for improvement. There's never going to be a day when I decide I'm good enough." 6. When did you last practise and what did you play? "I've been in a musical [American Idiot] in the West End for the last few months and I have my first solo gig since finishing this week. So I've just been practising my own songs, making sure I remember them all!" "It's either Django Reinhardt or Nile Rogers, I can't decide. They are, admittedly, incredibly different players but there is huge amount to be learnt from both." "Any stringed acoustic instrument and I'll be pleasantly distracted for a good three, maybe four years." "I love it when stuff goes wrong or breaks or blows up - it makes my job even more interesting. I've been doing gigs when the power to the whole building's gone. Now, that was fun." "Just play all the time and experiment. I spent lots of time in the beginning learning the theme tunes to my favourite TV programmes. It was a really fun way to practise. If it's good enough for Jimi Hendrix..."
RNIB's See Through Sound event is returning on 14 October at Cadogan Hall in London. The acts announced are Newton Falkner, Badly Drawn Boy, Doc Brown, Kevin Simm, Vaults and Andy Jordan. Tickets priced at £25 are available from Ticketmaster.